Here is the fifth installment of The Bergman Files, this review courtesy of fellow critic Jonathon Fisher. Jon is the creator and editor of The Film Brief and host of The Film Brief podcast which you can find on iTunes. Thanks to Jon for the review, and be sure to check out his website and podcast (which he kindly lets me co-host). Bergman denigrates Port of Call (1948),or at least, his influence on the film, in the above quote and his attitude towards the film typifies its place within his canon. 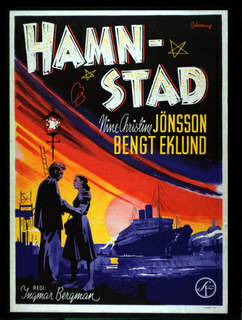 This was the fifth film by the great Swedish director, and it lacks the confidence and grace of his later works. On its own terms, though, Port of Call is an interesting watch, a fine drama that hints at the great career that was to follow. The film begins with a tragic scene – an attractive young woman in a summer dress flings herself into the icy waters that surround an industrial Swedish port town. She is rescued, and carted off in a car, amid a ‘nothing to see here’ vibe from the townsfolk. This early scene hints at one (of several) distinctly Bergman themes that Port of Call touches upon – mental health, its fragility, and the indifference with which Swedish society wilfully regards it. This young woman is Berit (Nine-Christine Jönsson), who we learn is plagued by any number of personal issues that would drive anyone insane, including a tense relationship with her immediate family, whom she feels abandoned her as a child. After her suicide attempt, she meets Gösta, a young sailor who has returned to land after a prolonged period of working at sea. They gradually fall in love, and Gösta struggles to come to terms with Berit’s history as she reveals her tortured past to him, piece by piece. Port of Call is certainly identifiable as a work by Bergman. The psychologically tortured female protagonist, a male character who has difficulty dealing with the past, the edgy portrayal of sexuality and the struggles of working-class Swedes are all themes that the iconic director would return to, again and again, in his storied career. In this film, we get the sense that he is maturing. The characters are not as intricate, or portrayed as sympathetically, as in many of his other works. It suggests the talent that Bergman possessed at such a young age that even in a film that demonstrates his developing sense of character, that Port of Call still contains several scenes of elegance and beauty; the scene in which we meet Berit’s mother, for instance, or the final scene in which the lovers discuss their future. It is telling that Bergman is reductive of his influence on Port of Call. Bergman was a notorious navel gazer when it came to his own work (which most film fans would agree was a good thing), and was brutally honest about his work. In this instance, it is as clear to him as it would be clear to audiences familiar with his body of work that in 1948, when Port of Call was made, he was a work in progress, both as a film-maker and as a man. His later career saw far more incisive investigations of mental health, sexuality, issues of faith and existential malaise, than this one. Port of Call is no classic Bergman masterpiece, but it tells us something of his development as a film-maker, and as such should be prized by any serious movie enthusiast. Tim says: I agree pretty much completely with Jon on this one. This is another minor early Bergman film, but the themes are coming through more and more strongly. Worth checking out for a Bergman buff.